Stow-on-the-Wold, is a market town in Gloucestershire. It is the highest town in the Cotswolds with views over the lovely rolling hills (the wolds). It has been a market town since 1107 when Henry I granted the right to hold a weekly market. In 1330 Edward III granted a charter allowing an annual seven-day fair in August. Then and in 1476 Edward IV granted a new charter for two fairs, in the town’s central Square, in May and in October. Wool was an important commodity nationally and especially for Stow. Local fleeces were of an unusually high quality because of the limestone soil. 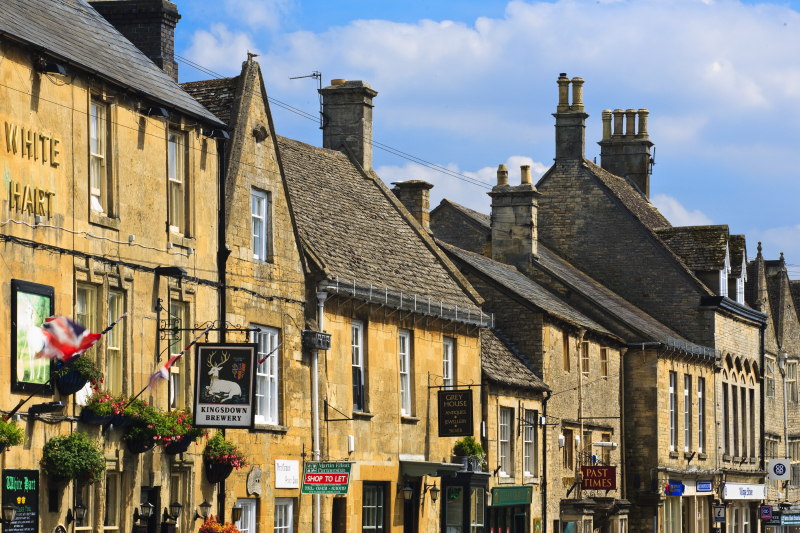 From the C15th builders used the limestone soil for building the town’s houses. In the town centre there is still a network of narrow alleyways leading from the Square to the town’s perimeter. These allowed the shepherds to count the sheep as they entered the market, and the lanes still exist today. ‘Cotswold’ means the shelter (cots) on the hills (wold) where the shepherd kept the sheep safe inside, over night. In time, the wool trade disappeared from the Cotswolds, but Stow’s fairs remain with horses rather than sheep. St Edward’s church stands on the site of an earlier Saxon church. The present church dates from the 11th century but has C15th additions. The tower, completed in 1447, is 88 feet high and reputedly has the loudest bells, eight in all, in Gloucestershire. The current clock dates from 1926, but a clock has chimed at St Edwards since 1580. 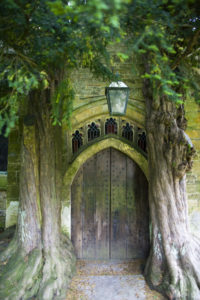 The church’s unique north door is framed by tree trunks. In March 1646 the roundheads defeated the King’s army at Stow. St Edward’s was the refuge for the many prisoners captured in the battle. In 1646, following the final battle of the Civil War, the Battle at Donnington, the church held 1,000 Royalist prisoners. The town’s stocks are on the green in The Square; these ones date from the C15th. The cross in the Square, dating from the C15th reminded medieval traders that they traded in the sight of God. St Edward’s Hall dating 1878, is a prominent feature of The Square, financed from unclaimed deposits in the Town Savings Bank. The hall hosts meetings and local events, and the town’s library. There is steeple built to hold the bell used to summon the fire brigade. The Royalist pub, which is at the corner of Park Street and Digbeth Street, is possibly the oldest in the country and has thousand year old beams to support its claim. Visitors to the North Cotswolds can enjoy a new ale, ONE FIFTY, brewed to an age-old recipe. Donnington Breweries uses its first-ever beer recipe from 1865 to make this 4% ale. The recipe was in an old recipe book which turned up, after 145 years, lying behind a cask during a spring clean. The brewery has revived the ale using the same mix of hops as they used for the original ale. The ale is on sale in 17 pubs. Thomas Arkell first brewed ale on the site of a C13th watermill in 1865; this was the start of the family business. Today, the business still uses the watermill to power the its pumps just as it did over 150 years ago. To find out more about this local Cotswold brewer visit.